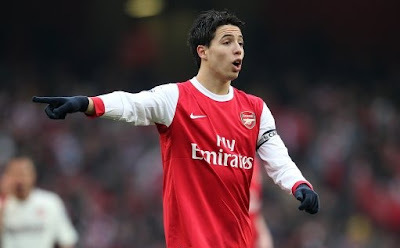 If there was one piece of advice I'd give Samir Nasri if he wants to stay at Arsenal, it would be to fire his agent. He's been so ill advised over his contract negations it's coming very close to the Ashley Cole car swerving £5k incident. Jean-Pierre Bernes has obviously smelt there is a change in the wind with fan's opinions of Nasri and just in case his client is forced to stay with Arsenal has been briefing journalists that it is not just money which is an impasse with Arsenal. He's told The Guardian - although not actually quoted in the piece - that it is important that Arsene Wenger shows his intent in improving the squad in the transfer market which is also important to Nasri as his wage increase to £110,000 a week. Does he think Arsenal fans are stupid? We all know the prime reason Nasri has yet to sign his new deal and that has nothing to do with us signing new players. It's all about his weekly wage. If it's not nearly double his current £67,000 Nasri and Bernes will be walking away from the table. I don't think we can blame the club if the Frenchman doesn't sign a new deal. They've made all the running on this one and it hasn't been the club who have put talks of a new deal on hold. Nasri and his agent want to hold all the bargaining chips. If they don't want to agree to Arsenal's terms he'll be sold and I think we'll be reaching that conclusion very shortly... possibly by the end of the week. And it seems Rio Ferdinand is trying to out play Barcelona's players with his statement that Nasri is "one of the best players right now". Yes, we know and that's why we want to keep him and your manager wants to sign him! After reporting yesterday Barcelona were preparing a £40m plus Thiago Alcantara deal for Cesc Fabregas, the Daily Mirror are now saying the Spanish champions won't offer that at all but will offer Arsenal less money than they bid a year ago. I think you all know what I think of that idea. And just to remind Cesc that he'll be sat on the bench, Former Barca player and coach Johan Cruyff has said he'll be one of four players fighting for three places in the team. I think Cesc Fabregas should be the first name on any team sheet and if Barcelona can't recongnise that then quite frankly they've underestimated the importance of the player. Why would he want to go from starting every game to being sat on the bench every fourth game or missing out on starting Barca's most important games? We know at Arsenal he's the first player on the team sheet. If he's fit he'll play. I don't think Cesc wants a repeat of what happens when he's on international duty and he becomes an impact sub. He'll want to start each week and rightly so. It seems there is quite a few rumours doing the rounds we're very close to signing Lille forward Gervinho. His agent has apparently said he'll be coming to Arsenal and the Daily Mail are reporting that Manchester City are sniffing round him as well. I wouldn't expect any signing, if indeed we are in the process of signing him, to be announced before Thursday at the earliest with Arsene Wenger away working for French TV. And talking of the French national team, only Abou Diaby was involved in their 4-1 victory over the Ukraine last night coming on for the final 24 minutes. According to reports, a player we've been scouting Marvin Martin (great name) made all the difference on his debut, scoring a brace and providing an assist. It appears Arsenal will have to move quickly if they want to sign Blackburn's Phil Jones who heads to Denmark tomorrow with the England under-21 squad. According to the Daily Mirror a £16m cash offer would trigger a clause in Jones' contract which would allow him to be sold. The Sun report Patrick Vieira is to decide whether to continue playing or retire. One of his options is to become a coach at Arsenal according to the paper. Barnet announced that their traditional pre-season opening game with Arsenal wouldn't go ahead. I'm quite disappointed that we won't be starting our season at Underhill. And finally, moaning Billy Gallas has said Arsene Wenger was wrong to let him leave. I would have to disagree, but then I'm not very objective on Gallas.